When Izenstatt’s business partner Jim Chamoff came into the Maine SBDC, he was looking to expand the business. He wanted to start making and selling “mini” cheesecakes to convenience stores and Whole Foods Market. He needed capital in order to ramp up production, including design and packaging of the new mini cheesecakes. For help acquiring the financing for this project, Chamoff turned to Maine SBDC Business Advisor Peter Harriman. Harriman helped him set up a loan package, especially focusing on the financial projections for the new line. 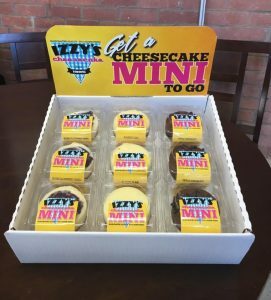 With the help of the Maine SBDC, Izzy’s Cheesecakes was able to obtain financing from the Greater Portland Council of Governments and the City of Portland for the mini cheesecakes, a grab-and-go version of the full size treat. 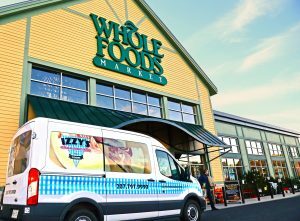 The company has now expanded into many convenience stores and 40 Whole Foods markets. 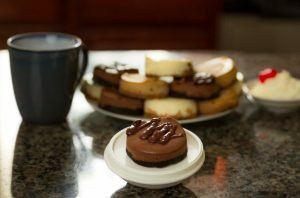 The cheesecakes are served in over 200 restaurants, grocery stores and retail establishments throughout New England. For more information on this business, visit their website or follow them on Facebook.